Powerful forces are standing ready to help keep the Paris climate agreement alive. An open letter, sent today by the Forum’s Alliance of CEO Climate Leaders, is significant for two reasons. Firstly, with 50 global CEOs running organizations with a combined annual revenue of more than $1.5 trillion (that’s roughly the equivalent to the GDP of Australia or Spain) calling on governments to step up efforts to fight against climate change, it’s a welcome reminder that powerful forces stand ready to help keep the Paris Agreement alive. Secondly, coming as it does before climate leaders meet in Katowice, Poland at COP24, it provides us with a timely opportunity to assess the business community’s role to date in helping meet its ambitious goals. First, let’s look at some numbers. According to data disclosed to CDP, of the 50 organizations whose CEOs signed the open letter, 30 of them reduced carbon emissions by a very healthy 9% between 2015 and 2016. In absolute terms, this equates to more than 47 million metric tonnes of CO2, the same impact as taking 10 million cars off the road for an entire year. Is this good news? On the surface, yes: 9% in one year is much greater than the average 3%, which is often used as an indicator for annual emissions reductions needed to stay in line with the science, despite being a slightly outdated estimate. However, there are nuances. Not all of the signatories achieved the same rate of success. Some of those that achieved the greatest reductions were in the power sector, where leading companies are moving away from coal and switching to gas and renewable electricity generation. Policy drivers are having a positive effect in this sector, but for other sectors, voluntary action is critical to accelerate emissions reductions. Whichever way you look at it, all those companies that disclose their carbon emissions, and have processes in place to understand the risks and opportunities that climate change poses to their business, are heroes. The movement towards public disclosure still has a long way to go and is far from becoming mainstream across the globe. And for those that don’t proactively report to investors and other stakeholders, artificial intelligence capabilities are developing at a pace that means it soon won’t be necessary – a computer will do it for them. Other reasons to be cheerful? For one thing, the really big transformational shifts take time, but they are very much within the realms of possibility. A report produced for the Global Climate Action Summit, indicates that we are only beginning to see the benefits from years of investment into clean technologies which will deliver exponential growth in the near future. For example, a 23% rise in solar power between now and 2030 – roughly half of the rate at which it is growing currently – will translate to a 50% reduction in CO2 emissions from electricity generation. Similar revolutions for industry in the circular economy, or from electrification in transport fleets, will yield equivalent impacts. 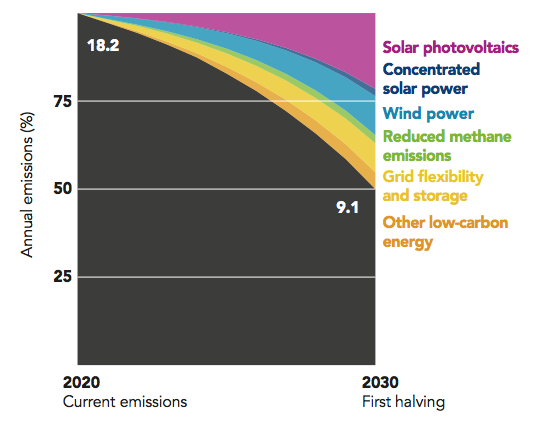 Exponential climate action roadmap – energy supply. Also encouraging is that businesses are finding their own pathways to deliver on the Paris Goals. 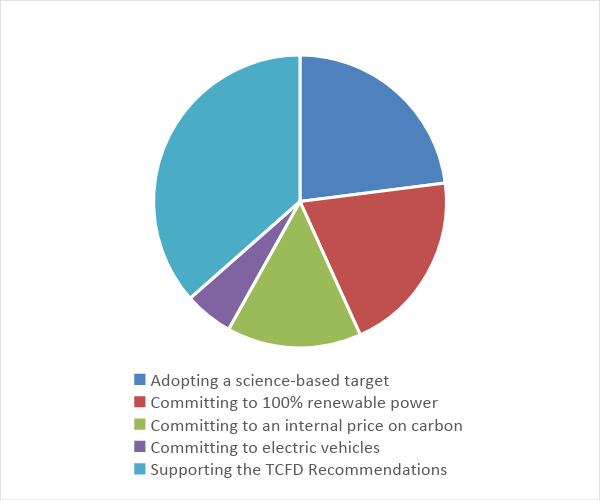 From our analysis below, the most popular among the Climate CEOs is supporting implementation of the Task Force on Climate-Related Financial Disclosures (TCFD) recommendations, followed by adopting science-based targets. Next up is committing to 100% renewable power, followed by adopting an internal price on carbon, and finally electrifying vehicle fleets. This diversity in climate action is a reflection that not all businesses have the same role to play in making carbon cuts. For some, switching to renewables can reduce a significant portion of their own emissions but does nothing to address the much bigger problem in their value chain where renewables are not available or where emissions from land use are the more significant culprit. One other point worth remembering is that there is a growing body of evidence that economic growth is decoupling from carbon emissions. According to the World Bank, over 20 countries – including the US, Germany, France and the UK – have reduced emissions since 2000 and grown their economies. This is largely down to wise policy measures; a key reason why the Climate CEOs' plea to leaders to put effective carbon mechanisms in place and develop smart market-based incentives should be heeded. Not that any of the above facts should give grounds for complacency, however. 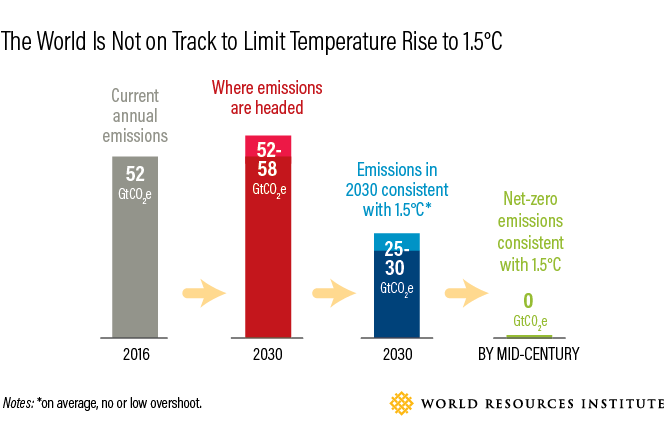 For one thing, the world is NOT on track to limit temperature rises to 1.5 degrees. For another thing, the Climate CEOs very much resemble the vanguard of industry – there is nowhere near enough support across the global business community for anyone to be able to suggest a sustainability revolution is around the corner. According to the Science Based Targets initiative, 498 companies have so far committed to using science-based targets to understand how they can limit emissions, while 151 have set targets that meet the criteria. A key part of the Climate CEOs' activities in 2019 will be incentivising their peers to do more. The UN Climate Summit in September next year is a key milestone – not just for increasing company commitments to the existing initiatives that are helping to deliver tangible results – but to get behind new coalitions and alliances that bring the public and private sectors closer together to address the real challenges and opportunities that the world is facing.